This article was written on the twenty-fifth anniversary of what many experts consider to be the genesis of international search and rescue operations and it aims to give the reader a perspective of the lead international agency that helps drive the agenda of the global USAR system. It was on December 7th 1988 that the northern region of Armenia was struck by a magnitude 7.0 earthquake. In a matter of minutes more than 25,000 people had died and the cities of Spitak and Leninakan were reduced to rubble. In the chaotic response that followed, more than 110 countries sent humanitarian aid including medical and search and rescue teams. Much of the aid was not specifically requested; most was uncoordinated both with the Government of Armenia and between responding organisations and agencies. Following a response that left much to be desired in terms of management and effectiveness, a number of organisations met to discuss how such a response, particularly an initial rescue operation, could be improved. These discussions eventually led to the formation of the International Search and Rescue Advisory Group (INSARAG) [www.insarag.org] and, in turn, to the development of mutually agreed minimum standards for coordinated and principled rescue and relief operations. Initially comprising of some western European countries, the USA and a few developed countries from the Asia/Pacific region, INSARAG has now grown to the point where nearly 100 countries and organisations are members of the Group. Membership of INSARAG is open to all countries and/or organisations involved in Urban Search and Rescue (USAR) activities. Countries that plan on receiving USAR assistance if required and countries that plan to build local USAR capacity are as welcome to become INSARAG members, as are countries that already send existing USAR teams overseas. Since 1988, INSARAG has continuously learned from each disaster that its constituent organisations have attended. Earthquake responses to Turkey, Pakistan, Haiti and, most recently, New Zealand and Japan have been reviewed and the lessons learned have been and are being incorporated into its suite of guidance documents. In 2002, the United Nations General Assembly recognised the valuable work being done and awarded INSARAG its mandate contained within Resolution 57/150. The Resolution is titled, “Strengthening the effectiveness and coordination of international urban search and rescue assistance” and gives INSARAG and its members a clear and unequivocal mandate in their work towards disaster preparedness and response. A Steering Group comprising members selected from its constituent countries and organisations directs the work of INSARAG. It is supported by a full time Secretariat, which is hosted in the Field Coordination Support Section (FCSS) of the Emergency Services Branch (ESB) of the United Nations Office for the Coordination of Humanitarian Affairs (UN-OCHA) in Geneva. The steering group is made up of representatives from the three regional groups – Americas, Asia/Pacific and Africa/Europe/Middle East. Whilst the Steering Group decide policy, representatives from the international search and rescue team leaders decide on operational procedures and standards. The major achievementof INSARAG as an organisation is the development and almost universal adoption of a suite of guidance documents and coordination tools that informand assist organisations, and indeed countries, in the prosecution ofinternational rescue and humanitarian relief operations. The core guidance document is the ‘Blue Book’ or INSARAG Guidelines, theunderpinning methodology appropriate forall international USAR operations. Adopted ‘de facto’ by most of the major response organisations, including the European Union Civil Protection Mechanism and the US Federal Emergency Management Agency, the Guidelines set out the roles and responsibilities of countries and organisations, advise as to minimum standards for capability and ensure standardised structures and procedures amongst international USAR teams. The basic function of the Guidelines is to set the ‘minimum standards for international operations’, and these standards are expressed in terms of performance and outcomes. Therefore, it is the responsibility of each team to select their equipment, techniques and operating systems as long as these meet the minimum standards required in terms of capability. For example, penetrating through a concrete floor to reach a victim trapped below can be done using a variety of equipment and techniques. The INSARAG Guidelines do not dictate how this should be done, but they do establish the expected parameters of the operation such as specifying concrete dimensions, safety considerations, supervision, logistical and medical requirements. The INSARAG Guidelines recognise three levels of USAR capability. USAR Awareness. In the UK, Fire Rescue Service (FRS) crews, paramedics or trained voluntary sector personnel, would represent this level of capability. National USAR Teams are usually of Light, Medium or Heavy capability and work with their own national response system. The National Resilience USAR teams are probably the best examples of this within the UK response system. International USAR Teams are of Medium or Heavy capability and operate under the principals of self-sufficiency and air mobility whilst adhering to the minimum operational standards stated within the INSARAG Guidelines. In the UK, this level of capability is represented by UK-ISAR, a team created from selected FRS and supported by the Government in the form of the Department for International Development (DFID). Medium International USAR teams must have the capability to perform all search and rescue evolutions, maintaining continuous operations at one site for the duration of the rescue phase. This would include the capacity to locate trapped victims under debris, provide appropriate medical care, release them and recover them to a place of safety. The team must be capable of being transported by air, whilst also being self-sufficient in every way. Typically, this requires a minimum team of 38 to 40 personnel, including management, logistics, medical and search and rescue specialists. Heavy International USAR teams must have all the abilities and capabilities of a Medium team and the additional capacity of being able to operate simultaneously at two sites for the duration of the rescue phase. Inevitably, shift operations at two geographically separate sites have significant consequences, requiring a much larger team size. INSARAG Heavy teams typically comprise of 55 to 70 personnel, with a subsequent increase in the amount of equipment required to support search and rescue operations. Uniquely amongst international humanitarian relief operations INSARAG provides countries, struck by disaster and needing to request international assistance, a degree of operational assurance. Through a system of peer review, any team within the INSARAG system can be classified as meeting all the requirements of the INSARAG Guidelines, including capability and self sufficiency. Such a system allows countries affected by earthquake, typhoon or tsunami to separate out the many disaster tourists and restrict access to only those teams that are both competent and effective and will work within the accepted humanitarian methodology. So popular and effective has the INSARAG External Classification (IEC) system been proved that other sectors of the humanitarian relief community such as health, water and sanitation are now looking to replicate this system and provide both donors and recipients with some confidence that aid agencies can actually deliver what they claim. As the reader might remember, I mentioned previously that, in addition to the INSARAG Guidelines, the organisation has been responsible for developing a number of coordination tools and methodologies that guide international rescue operations. Firstly, the On-Site Operations Coordination Centre (OSOCC) provides a platform for cooperation, coordination and information management among international humanitarian agencies and links into the national response system of the affected country. During a response to any large and complex earthquake the OSOCC is now supported by a dedicated USAR Operations Cell, which coordinates the rescue operations of international teams and provides information and advice to the affected country via the OSOCC structure. Secondly, the Reception/Departure Centre (RDC) at the entry points into the affected country helps to better coordinate team assignment and logistics support during rescue and relief operations. USAR teams within the INSARAG methodology are required to train personnel to staff an RDC and to support the functions of an OSOCC or USAR Operations Cell. Finally, the establishment of an on-line hub for real-time information exchange during ongoing emergencies. The Global Disaster Alert and Coordination System (GDACS) [www.gdacs.org] alerts users to an earthquake within minutes of the impact and provides them with an assessment of the likely impact on the local population. GDACS also allows responding INSARAG teams to exchange information and coordinate with each other, with other humanitarian organisations and with the affected country. The positive response from the international humanitarian community to the INSARAG Guidelines and the supporting coordination toolsis highly encouraging and will lead to better coordinated rescue and relief operations, which in turn, will lead to more lives saved. Whilst front-line responders working within national systems such as CFOA-led National Resilience programme in the United Kingdom may not immediately appreciate the influence that INSARAG has had on the development of their systems of work and methodologies, such influence has undoubtedly been significant. The aim of INSARAG is to remain an influence in both international and national USAR operations, ensuring that all countries benefit from the shared knowledge and experience of its members. Significant work has already been done in developing an international ‘operational assurance’ methodology based on minimum standards, the IEC system. This system will be further refined and may prove a model for some national authorities as they seek to develop and assess their own USAR capabilities. INSARAG, in this era of global recession, is also tackling the matter of the cost effectiveness of USAR response, by looking at how USAR teams can be more widely used in disaster situations. 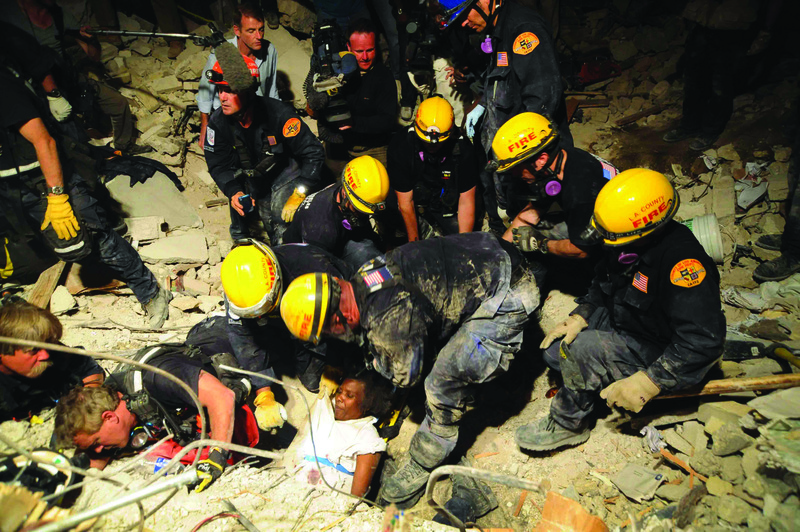 While this means that USAR teams need to be prepared to undertake activities outside of the traditional ‘life saving’ role, there is already evidence from recent disasters that USAR teams can prove highly effective in supporting communities in the initial recovery phase following a disaster. Another key challenge for the USAR community is the capture, analysis and effective use of information (sharing). In the age of the smart phone, crowd-sourcing and the cloud, quantity of information about a disaster is no longer an issue, indeed the challenge for responders is to avoid being overwhelmed by information. INSARAG is working with other humanitarian relief organisations to develop shared tools and methodologies that will be available to all and shared by all, so that international and national disaster response continues to improve and develop. INSARAG has played a pivotal role in the improvements that we have seen in the last 25 years and will continue to play a role in the future development of urban search and rescue. David Dickson is a Director of Civilience Limited. He was the National Coordinator for the UK International Search & Rescue Team (UK-ISAR) and worked for the UK Government to develop a national urban search and rescue capability in the UK Fire and Rescue Service. He has worked for both the UN and European Union Civil Protection (EUCP) and has considerable experience of the US system of disaster response, working for Texas Engineering Extension Service (TEEX) as International Project Coordinator.